Patapaa Amisty’s girlfriend, Queen Peezy could not take the heartbreak from being dumped by Patapaa and has reportedly collapsed upon seeing the video of Patapaa kissing his new white girlfriend in Germany. 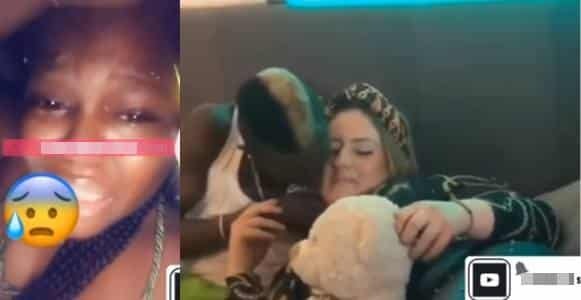 Report say the singer who became famous after his single ‘One Corner’ went viral on social media, met the white woman in Europe where he’s currently on tour. The video which surfaced few days ago shows him and the white woman in bed and in the kitchen playing love games. This was after a video surfaced showing Patapaa’s girlfriend crying that he has dumped her. She’s currently receiving drips at the hospital she was rushed to after she slumped.